For me, being a copywriter is more than a job. It is an adventure. Every day is different – and so is every customer. In the course of one day, I may be a storyteller, seller, explainer and seducer. Like a starship captain, I explore ever new worlds. Lifestyle fair or laser cutting, building automation or brewing, event management or Christmas market: each subject reveals surprising sides. Finding out what moves people and how my words can move them – that is one of the reasons why I love being a copywriter. Since 2009 freelance copywriter and PR consultant. Based in South-West Germany, near Reutlingen/Stuttgart. 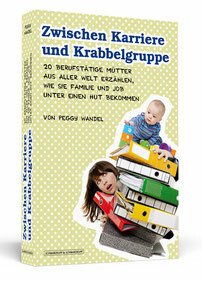 A book about 20 working mums from all over the world and how they manage to combine family and work life.